Danner Cattle, Muscatine, Iowa is located in southeast Iowa between the Mississippi and the Cedar River. Ralph Danner Sr. moved to Muscatine Iowa from Illinois in the late 1940’s. He showed carloads at the Chicago International from 1950 to 1971. Ralph Danner Jr. grew up farming with his father and still today farms but now with his son, Ben. Ralph Jr. enjoys exhibiting at carcass shows around the U.S with his favorite being the Beef Empire Days in Garden City, Kansas. The Danner’s have been raising, showing, feeding, and selling cattle for three generations in the Muscatine area. Ben’s first sale was a Club Calf Pasture Sale back in 2004. He continues to sell club calves and then in 2008 he had his first production sale, the See and Believe Elite Female Sale, which continues annually the Saturday after Thanksgiving. Danner Cattle admire well put together cattle that will work for any cattlemen through all phases of the industry. We enjoy good cattle and making sure the right families have the right cattle for their herd. 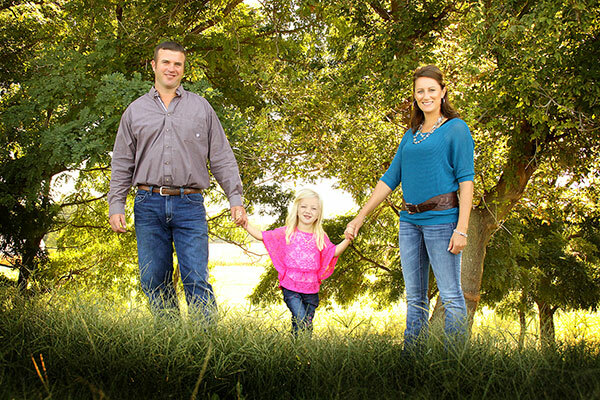 Ben and Monica reside a few miles from the home place with their daughter Bailey who enjoys growing up in the cattle industry and being part of the day to day operations!